Thanks to all of you who responded to last week’s blog on my grandson Adler. We appreciate your thoughts, prayers and support. They truly do help us get through the occasional rough times that are a part of Adler’s life now. 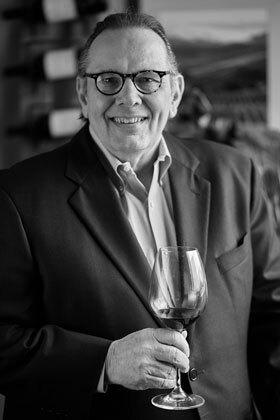 One of the reasons I started Tiedemann On Wines was to be a source of information and education on wine. I hope I have accomplished that over the past couple of years of publishing my blog. You all will have to be the judge of that. Today’s blog on Chardonnay is just such an article. I hope you find it informative and educational. A glass of Chardonnay on a hot afternoon or with a dinner salad or certain entrées is quite enjoyable. I am always on the lookout for new and interesting educational topics for the blog. I stockpile a lot of wine magazines, internet articles, etc. for future reference and research. 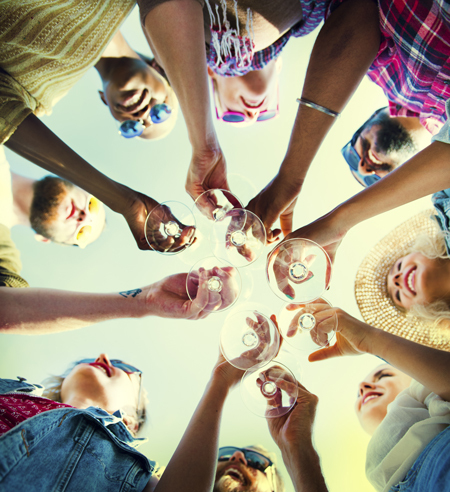 Last week I was paging through a back issue of Wine Business Magazine and came across an article on a 2015 survey of American wine consumer preferences. The survey was completed by the Sonoma State University and the Wine Business Institute. As you can imagine, there are pages of facts and results to the survey. Some facts are interesting while others…well let’s say they fall into the “I don’t care” category. 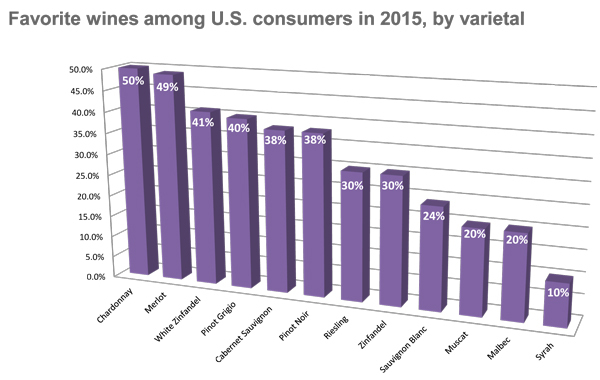 The part of the survey that interested me most, and what I want to cover in the months ahead, is on the favorite wines of today’s U.S. consumers. 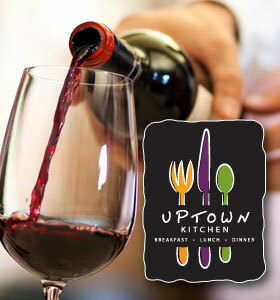 I intend to pick some of the favorite wine choices of U.S. consumers and report on them to you. It isn’t my intention to do these reports week after week (as that would bore the best of us). But I will pick a top wine and do a piece on that wine maybe once a month. Results from a 2015 survey of American wine consumer preferences completed by the Sonoma State University and the Wine Business Institute. I was surprised that Cabernet Sauvignon was 5th on the list and didn’t rate higher. I have been under the impression that it was the #2 best selling wine in the country. This particular survey clearly indicates that was a misconception. I hope you enjoy this article on Chardonnay and it makes you want to rush right out to your local wine shop and pick up a bottle. Chardonnay grapes are a green-skinned grape that it is believed originated, or at least gained its popularity, in the Burgundy wine region of France. Today the grape is grown worldwide. It is estimated that there are over 400,000 acres planted around the world. In the U.S. we grow Chardonnay from coast to coast with the most success being in the Sonoma Coast region of Northern California. That is one of the reasons I switched my Glenwood Cellars Chardonnay production from Napa Valley to Sonoma. I believe the grapes are better, thus a better Chardonnay can be produced. 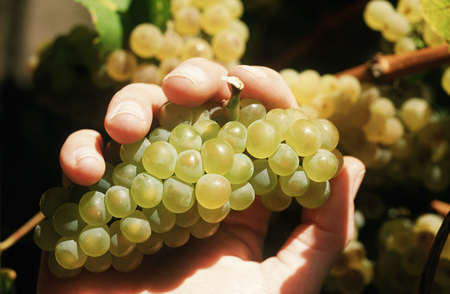 The Chardonnay grape is typically a very neutral tasting grape. It gains its diverse flavors and is influenced by terroir (soil and growing conditions) and from its aging in oak barrels. As far as flavor profiles go Old World Chardonnay flavors tend to be lean, soft, crisp and minerally, while New World Chardonnays will produce oak and tropical fruit flavors. In regions such as Chablis in France and Carneros in the Sonoma region of California, Chardonnay tends to have some acidity with flavors of green plum, apple and pear. Wines from these areas tend to be medium to light bodied. In warmer climates the Chardonnay flavors become more citrus, peach and melon flavored. These very warm locations produce wines with flavors of figs and tropical fruit such as banana and mango. The remaining flavor factor is oak. The extent of the oak flavors in some Chardonnays depends on how long the wine is aged in oak barrels. And with what percentage of new oak barrels versus older oak barrels is it aged in. 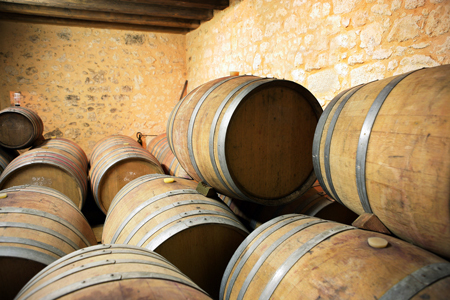 The more new the oak barrels, the more intense the oak flavor becomes in the wine. Naturally controlling these two factors has a big impact on the oakiness of the wine. Chardonnay is the most popular white wine from California. It is said that one of the best areas to produce California Chardonnays is the Russian River Valley area. My 2012 Glenwood Cellars Chardonnay (rated at 90 points by Wine Enthusiast magazine) is produced from a blend of grapes grown in the Russian River Valley and Sonoma Coast areas. Because Chardonnay comes in a wide variety of styles, textures and flavors, there are a diverse array of wine and food pairings that work with Chardonnay. As an example, it pairs well with all types of seafood from shell fish to grilled fish. It is perfect for garden salads with crumbled blue cheese and certain dressings. It also pairs well with chicken, veal, pork, turkey, and other white or light colored meats. Due to the natural acidity in Chardonnay, it makes the perfect partner for a wide variety of hard and soft, or even creamy, cheeses. Like all wines the pricing for a bottle of Chardonnay varies greatly. You’ll find pricing starts around $10.00 to $11.00 per bottle and runs as high as $95.00 to $100.00 a bottle for the higher-end California Chardonnays such as the Peter Michael and Aubert brands. There are also some pricey Old World (French) Chardonnays as well. However, you can get some really good Chardonnays in the $15.00 to $25.00 range. I think this is a situation where you might want your local wine shop experts to guide you on your selections. They are familiar with the flavor profiles of the various Chardonnays they carry. As always I appreciate your support of my blog and encourage you to share it with family and friends. If you are reading this blog for the first time please consider subscribing while you are on the website. 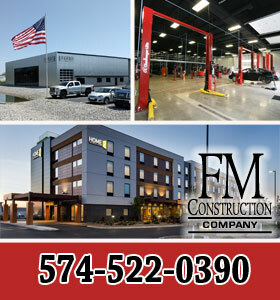 This way you’ll get our reviews and articles in your email. If you care to share your comments on this blog posting or other topics, please do so in the comments section below.